A faithfully adapted graphic-novel retelling of the first Printz Award winner. 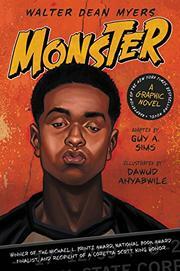 If ever a novel lent itself to a graphic adaptation, it is Monster (1999). Written in a screenplay format interspersed with first-person journal entries, it practically adapts itself into a visual presentation. Fortunately Sims and Anyabwile are smart enough not to mess with a good thing, and they stick closely to the original to tell the story of New York teenager Steve Harmon’s trial for felony murder. Myers’ admirers will be pleased to see much of the original dialogue and narration preserved, though neatly edited in places to keep the pace brisk. Meanwhile, Anyabwile’s black-and-white illustrations do more than simply interpret the original’s camera directions and descriptions. They also add subtle layers to the courtroom accounts and journal entries, all while maintaining the narrative suspense and ambiguity that’s made this story linger with a generation of readers. It’s not any clearer in this version what role Steve truly might have played in the crime. Black gutters between panels and heavy shading create an appropriately oppressive atmosphere. Though the overall effect can be muddy, it generally suits the darkness of the story and the bold lines of Anyabwile’s figures.